You may recall a little over a month ago us announcing the brand new major release of BackupAssist version 7.1.That included an impressive range of new features such as a beta of the new Exchange Granular Restore (EGR) add-on, support for Exchange 2013, enhanced support for Server 2012 and history for imaging backups on NAS and RDX drives. Well, following up the great work on 7.1, Australian developer Cortex have completed the EGR add-on beta phase and have released the feature in full in this latest iteration of our favourite backup software for small businesses. What is the Exchange Granular Restore add-on? 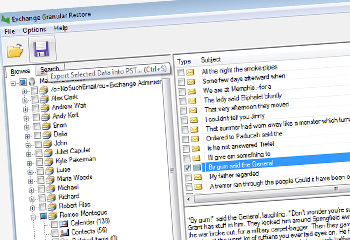 In previous versions of BackupAssist using the now legacy Exchange Mailbox Add-on (EMA) it’s always been necessary to create PST’s in order to have that ability to restore individual messages and mailboxes at brick level. The new Exchange Granular Restore Console (EGR) however, enables administrators to achieve the same but by restoring directly from the Exchange information store backup. It also offers far more advanced search functionality so it’s simpler to find what you’re after prior to restoring. The EGR is a huge improvement as it slashes setup time, makes it much easier to perform restores and there’s a big saving on the amount of storage required too. Read the full release notes here, then upgrade to BackupAssist v7.2.